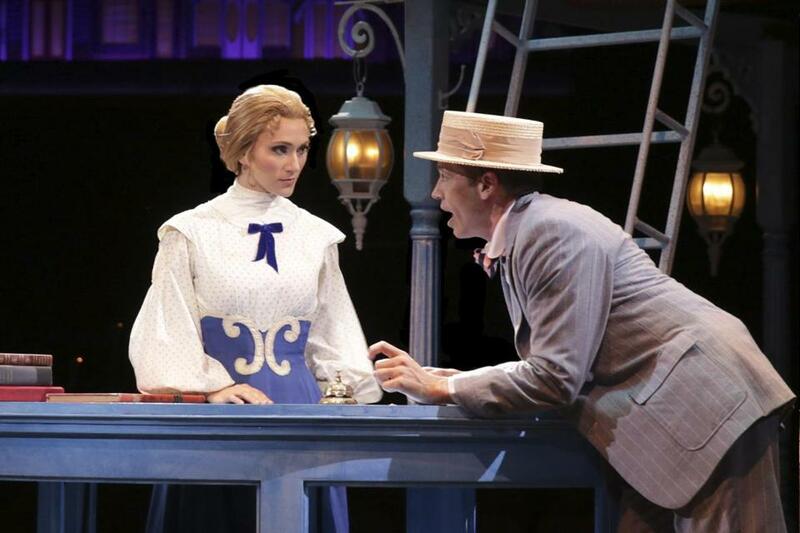 Siri Howard as Marian Paroo and Matt Loehr as Harold Hill in “The Music Man’’ at North Shore Music Theatre. BEVERLY — You might not be in the mood for a show about a flashy, loud-mouthed con man who knows nothing about his supposed profession but nonetheless gains the support of rural residents in the Midwest by stoking their fears, anxieties, and insecurities. That might hit just a bit too close to home these days. However, if you can set aside thoughts of any parallels to a certain Twitter addict currently infesting the public sphere, you’re likely to have a fine old time at the spirited production of “The Music Man’’ that is now kicking up its heels at North Shore Music Theatre. “You gotta know the territory,’’ a salesman proclaims at the start of the “The Music Man,’’ and the creative team behind this vibrant staging does indeed know the territory when it comes to this venerable warhorse. Starting with the innovative opening number, “Rock Island,’’ in which rapid-fire dialogue among a group of traveling salesmen is syncopated like the staccato rhythms of a moving train, director Bob Richard keeps things moving too fast for any cobwebs to gather. Harold is portrayed with dashing suavity at North Shore Music Theatre by Matt Loehr, decked out in a striped suit and straw boater. At first, I missed Robert Preston, who brought marvelously stentorian brass to Harold in the 1962 film version, and presumably to the Broadway production, where Preston originated the role. (At no point did I miss Matthew Broderick, who gave a barely awake performance as Harold in a 2003 made-for-TV movie.) Loehr’s rendition of “Ya Got Trouble’’ — the wonderful patter song in which Harold issues colorfully dire warnings to River City residents about the encroachment of vice on the town’s young — does not achieve the glorious heights of Preston’s version. But Loehr grows on you, just as Harold grows on the initially skeptical Marian Paroo (Siri Howard), the town librarian and piano teacher. Marian knows enough about music (and male charlatans) to see right through Harold, but she also sees into Harold, and finds there qualities that he himself might not be aware he possesses, and falls in love with him. Corny and old-fashioned though it is, “The Music Man’’ retains a cockeyed charm, partly because of its distinctively regional flavor. Willson’s script is loaded with colloquialisms like “That fella’s been the raspberry seed in my wisdom tooth long enough’’ and “He’s slipperier than a Mississippi sturgeon.’’ Again, for full enjoyment, any contemporary parallels should probably be ignored. Don Aucoin can be reached at aucoin@globe.com.